Everyone concerned with philosophy—the college undergraduate just becoming initiated into the fascinating realm of metaphysical inquiry, the interested adult anxious to grapple with questions of fundamental importance, or the busy teacher seeking to whet his student’s appetite for truth­—all will find this concise, reference book of the terms most commonly used by scholastic philosophers of remarkable value. Arranged in dictionary form, this work contains over 1,600 entries and subentries of scholastic terms and phrases, and includes in addition over thirty charts and diagrams providing salient information on such topics as the divisions of act and potency, the kinds of appetites, the categories of being, the types of law and their relations one to the other, the powers of man, and many others. Within an entry the sequence, in general, is as follows: term or phrase defined; its part of speech; its meaning; cross references to antonyms, synonyms, and related terms; abbreviation of the term; uses, particularly of adjectival terms; divisions of incidental terms and phrases using the main term; references; charts and diagrams. 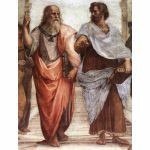 Preference is given to the definitions of terms as found in Aristotle and Saint Thomas, but abundant attention is given to important concepts of such thinkers as Scotus and Suarez. 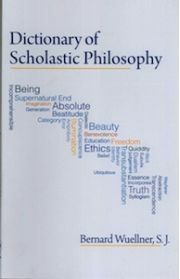 In addition, the author has cited references to the best of modern textbooks and to the pertinent works of prominent neo-scholastics, among them Maritain and Gilson. 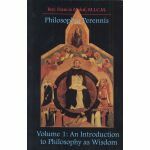 What renders the volume so valuable is the fact that it provides in compact form the important concepts common to scholastic thought. By giving clear-cut definitions it helps beginners avoid needless controversies and aids them to see the value of a particular philosopher’s insight into reality. Particularly valuable for the ever growing number of individuals clamoring for the truth handed down through the philosophia perennis, Dictionary of Scholastic Philosophy will be appreciated as a basic reference work of prime importance, one which helps all students of philosophy see the relationships between the separate branches of philosophical inquiry and to appreciate the value of definitions as a requisite for the sound philosophical analysis of reality.